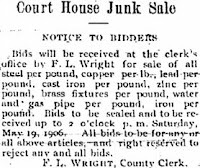 Amid the hustle to raise a new downtown Santa Rosa in the summer of 1906, the wreck of the old courthouse still sat in the center of it all, as unwanted as Sheridan Whiteside in "The Man Who Came to Dinner." The county put the job of demolishing the building up for salvage bid - that a contractor would pay Santa Rosa for the right to tear it down in exchange for the value of materials in the structure. But when the sealed envelopes were opened in August, the Board of Supervisors found the contractors wanted the county to pay them up to $4,500 for the work. The Board passed on those offers without comment, and it was nearly Thanksgiving before it was announced that a deal was struck: A contractor would pay $1,250 for the pleasure of doing the demolition work, and still get to keep everything as salvage. Gentle Reader is forgiven for thinking this deal smells a mite fishy. Why did only a single contractor offer anywhere near an acceptable bid? And why didn't that contractor - former Santa Rosa street commissioner J. W. Brackett - submit any bid at all when they were first requested? Although we can't know enough today to connect the dots, it smacks of a rigged contract by Santa Rosa's Good Ol' Boy network, or as the muckraking team over at the Republican newspaper had recently called it, a "scheming coterie of gentlemen who manage to protect their private interests by the conduct of the city government." There certainly should have been questions asked, editorials written, and maybe a call made for a Grand Jury investigation. Sadly, none of that happened; the skeptical journalists at the Republican left after the earthquake, and per usual, Press Democrat editor Ernest Finley had no interest in pursuing issues that might reflect badly upon his town. Who wants to buy the Court House? It is highly probable that someone will have the opportunity before long, if the present plans of the Board of Supervisors go through. The building was badly damaged by the earthquake, and soon afterwards a gang of men were put to work removing the wrecked portion, which included pretty much everything from the second story up. Most of the furniture, the law library, the numberous records, etc., were removed and now the building stands like a dismantled ship at harbor. It is understood that the Board proposes to advertise for bids, the highest bidder to take the building as it now stands and tear it down and remove it. Nobody seems anxious to buy the old Courthouse--the part that remains of it, and instead of the bids opened Thursday by the Supervisors offering cash for the big amount of material in the building, the bidders asked for substantial sums for wrecking the partially demolished structure, and for the material to boot. The Supervisors, after opening the bids, took them under advisement. The bidders were: J. J. Forget, $2,750; D. E. Albers, $3,250; Riley & Maroni, $3,497; Bacigalupi & Forni, $4,500.